The Mercedes-Benz CSR committee set a record over the weekend, with 3,452 people gathering to make kimchi as part of its Mercedes-Benz Promise KimJang Project, the company said Monday. The event gained the Guinness World Records title for the most people making kimchi simultaneously. Participants, who included employees of Mercedes-Benz Korea, dealers and affiliated companies, made 90 tons of kimchi and put it in 9,000 boxes, which were delivered to 25 food banks and 13 social welfare organizations in Seoul through the Seoul Council on Social Welfare. 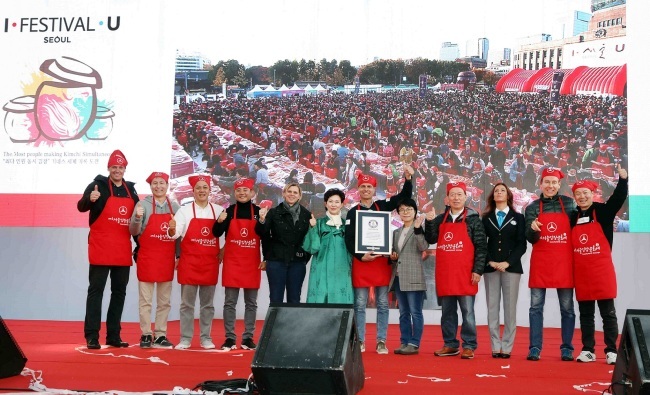 “It was a great pleasure to contribute to promoting Korea’s kimchi culture in addition to setting a meaningful Guinness World Records with many volunteers,” said Dimitris Psillakis, chairman of the Mercedes-Benz CSR Committee and CEO of Benz Korea. The event was part of the Seoul Kimchi Festival at Seoul Plaza, for which Benz was a major sponsor, having donated 300 million won ($266,856).